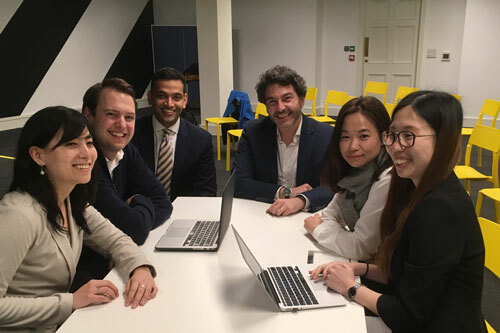 Cass MBA students recently headed to Dublin for their International Consultancy Week (ICW) where they worked on business strategy projects within a diverse range of industries including healthcare, artificial intelligence, fashion, banking, and real estate. The projects focused on designing solutions for business development issues in marketing, HR, finance or operations. The fastest growing European economy for four years running and a rapidly developing centre for technology, Dublin was chosen as a location for the ICW as it has a healthy entrepreneurship and startup scene which provides a dynamic environment for students to develop and learn. Dr Elena Novelli, Associate Professor in Strategy at Cass and module leader said the ICW, which comes at the end of the Full-time MBA programme, gave students the opportunity to apply what they have learned during their MBA to real business problems and this, in turn, empowers them to make sense of any type of challenge that a firm might face. “What is incredibly powerful about the MBA experience is that it teaches students the tools and frameworks to understand the structure of the problem and then find the best way to attack the problem leveraging their technical expertise to create value for the client,” she said. Dr Novelli said the students are able to develop their soft skills - managing relationships, coordinating people, setting expectations, delivering on them – and also learn how to work together to use their diverse competencies and strengths to deliver solutions for clients. The ICW proved rewarding for both students and the companies that they visited. James McIlroy is Co-Founder of House My Dog, an online community which connects dog owners with dog sitters to find a safe home for their dogs while they travel. He said he was delighted to work with the students and their work with House My Dog would have a lasting effect on the company. “Having the Cass MBA students at House My Dog was very beneficial in terms of our growth strategy going forward and the work they did was something that we will definitely be using in our expansion strategy,” he said. MBA student James Amoore said he was pleased that the visit brought results for the companies too. "It's an opportunity for us to be able to apply knowledge that we have gained throughout the MBA to a real company and get real feedback. It's an enormously rewarding experience - the CEO of the company said that it was very useful to get an outside perspective and it's great that he will take something away from it." Previous destinations for the ICW have included Iceland and Poland. It also runs in emerging markets in Chile, Columbia, Israel and Palestine. Watch highlights from the week here.